Is the global trade system broken? 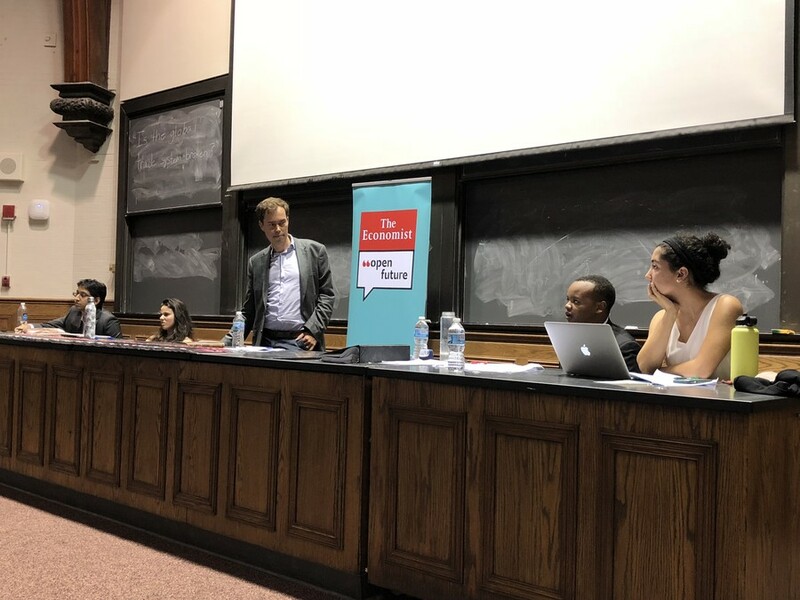 Chicago Debate Society takes on the question in a debate moderated by Economist journalist Adam Roberts. Third-year Adi Ram delivered a fiery rebuttal condemning the state of global trade relations at the kickoff debate of the year for the Chicago Debate Society (CDS) last week. The event was marketed as part of The Economist’s Open Future festival, a series of conversations hosted by Economist staff about the role of markets, technology and freedom in the 21st century. Roberts said this topic was conceived amid mounting concerns about the global drift away from the classical liberal values it seeks to defend. Second-year Rachel Blume joined Ram on the affirmative side, contending that the trade system is indeed broken, while third-year Drew Harrington and second-year Ava Sharifi defended global markets on the opposing side. Roberts pointed out before the debate began that The Economist was founded in large part to advocate for classical liberal values such as free-market global trade. In a poll before the debate began, he found that most audience members believed in free-market values -- one-fourth agreed with the affirmative team that the global trade system is broken. Some abstentions aside, most of the remaining three-fourths agreed with the opposition. While poll results remained largely the same by the conclusion of the debate, the arguments were still heated. Blume, speaking first, argued that global trade is a continuation of Western imperialism and harms less-developed countries. Citing export-led powerhouses like Japan, she said that protectionist and even isolationist policies can help countries develop robust economies and hedge against the risks of global trade. She went on to say that the current world trade system prevents less economically developed countries from developing. Harrington used the TPP and NAFTA trade deals and their resultant growth as examples of the world trade system working to benefit all countries involved. He further argued that the current world trade system actually provides less developed countries the resources needed to develop. “Only through current systems of [free] trade does India have any leverage over the U.S. or does the U.S. have any interest in the stability of India,” he said. Ram responded by comparing the position of less developed countries to that of an individual who has been continuously robbed for centuries only to have the robber offer to help them once they are destitute. “Colonialism started with [Western] companies like the East India Company seeking to exploit opportunities in Asia and Africa,” he said, arguing that modern corporations merely perpetuate these old power structures. Sharifi argued that the affirmative team was addressing issues from the past rather than offering solutions for the present. “The only way to work towards eradicating this global poverty is through free trade,” she said. After the debate, audience members asked questions not addressed in the debate, many of which considered the global consequences of increased automation. Several brought up the merits of trendy policy proposals such as universal basic income (UBI). After the debate, Roberts told The Maroon that he is skeptical of UBI and similar stipend programs, in part because he thinks they would require eliminating or scaling back the welfare state. Roberts maintains sticking to free trade.